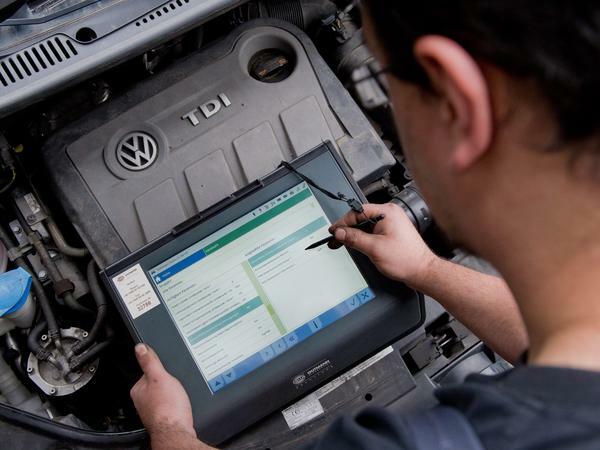 A service technician uses a diagnostic device in front of a diesel engine in a Volkswagen Touran in an auto repair shop in Hanover, Germany. Researchers have been pushing for freedom to learn more about the code inside cars in the fallout of the VW software-rigging scandal. It's an obscure provision of a relatively obscure law, overseen, rather unpredictably, by the Librarian of Congress. A section in the country's copyright law known as the Digital Millennium Copyright Act prohibits unlocking of "access controls" (in simpler terms, breaking digital locks to dig around computer code) on various software. Every three years, the Library's Copyright Office decides which computer programs should be exempt from that provision, and on Tuesday it issued a lengthy list of reinstated, new and expanded exemptions. Among them, for the first time, is car software. The exemption will allow owners of cars and agricultural equipment to access software in their vehicles for diagnosis, repair or modification — as long as the alterations don't violate regular copyright or other laws and don't meddle with controls of telematics and entertainment systems. The prohibitions on tinkering with car software have been in the news lately. Here at All Tech, we've reported on the complicated task of fixing tractors and other farming equipment when the fix is in the software. And we had this story on researchers pushing for more freedom to learn more about the code inside our cars in the fallout of the Volkswagen software-rigging scandal. One of them is Kit Walsh, a lawyer at the Electronic Frontier Foundation, which had petitioned the Librarian of Congress for the new exemption. "The reason that we've learned about a string of significant security vulnerabilities in vehicles is because security researchers have had the courage to face this legal gray area and do the research anyway," Walsh says. The Environmental Protection Agency and the Department of Transportation, too, had expressed concerns about the new freedom to tinker, so the vehicle software exemption won't go into effect for a year to give the regulators time to prepare. Owners of smartphones, tablets, wearable devices and smart TVs also get more freedom to access software in those devices. The updated list of exemptions reinstates freedom to "unlock" cellphones, which became an explosive issue after the exemption was allowed to expire and prompted Congress to pass a whole separate law. The law, by the way, allowed people to unlock phones on behalf of the owner, which the Librarian of Congress appears to view as something that will require legislative consideration if it is to be applied to other kinds of software. The new and updated exemptions also give researchers and users more freedom to access software in medical devices, phones, tablets, smart TVs, smart watches, other wearables and connected devices as long the work complies with regular copyright, fair use and other laws. Advocacy group Public Knowledge had requested that the Librarian of Congress allow people to make personal copies of their DVDs, but that petition was rejected. The group says that and other limitations in the ruling show that the DMCA overall needs to be rewritten — something that EFF and other advocacy groups have been pushing for a while. You can read highlights of the decision here. The Librarian of Congress gets to reconsider all of the exemptions again in three years.